GUELPH NISSAN AND COMMERCIAL VEHICLES: Excellence beyond compare, year after year. That’s the essence of Guelph Nissan. Our formula for satisfaction is simple: combine exceptional vehicles and exceptional staff The end result? An award-winning dealership in the heart of Guelph that has exceeded expectations since 1980. Our ever-evolving history of excellence includes your automotive future. Serving the Guelph area, Guelph Nissan, located at 805 Woodlawn Rd W in Guelph,ON, is your premier retailer of Nissan, Nissan Commercial, and Pre-Owned vehicles. Our dedicated sales staff and top-trained technicians are here to make your auto shopping experience fun, easy and financially advantageous. Please utilize our various online resources and allow our excellent network of people to put you in your ideal car, truck, SUV, crossover or commercial vehicle today! Guelph Nissan is the recipient of the Nissan Award Of Excellence. The highest honor for dealer excellence in our outstanding commitment to sales, Nissan quality and exemplary customer service. Guelph Nissan is proud to serve Guelph with quality Nissan vehicles. With models like the Altima, Frontier, Rogue, Sentra, Versa, we have something for every taste and need. Come visit us at 805 Woodlawn Road to see our vehicles and take one for a test drive. If you’re looking for a used car in Guelph, we can assist you there as well. Visit our inventory page to see our large collection of pre-owned vehicles. 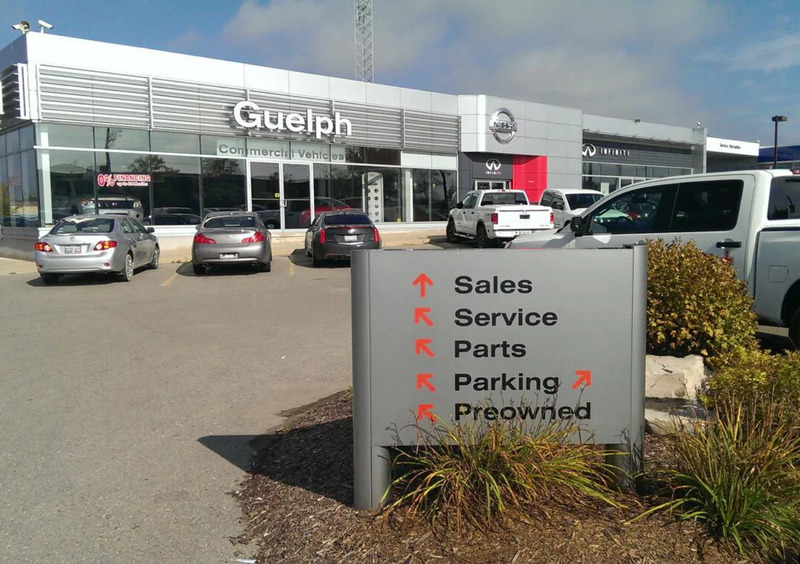 Guelph Nissan is not just your Guelph Nissan dealership, we also provide a full line of services dedicated to our Ontario customers. From Nissan car repairs performed by expert mechanics, to OEM Nissan auto parts, to car loans , Guelph Nissan is the smart choice for your automotive needs. Come in and say hi! We’re located at 805 Woodlawn Road or you can give us a call at 1-877-842-7996.